The menisci play an important role in absorbing impact load. It’s been shown that complete removal of a meniscus can result in progressive arthritis in the joint within a decade or so in a younger patient, and sooner in patients who are older with preexisting “wear-and-tear” osteoarthritis. Resection of 15-34% of a meniscus may increase contact pressure by more than 350%. Normal knees have 20% better shock absorbing capacity than meniscectomised knees. In most cases the anterior horn of both menisci is narrower than the posterior horn. Due to a broader horn being more likely to be injured, the posterior horn is more commonly injured (particularly in degenerative tears on the medial side). In adults, the blood supply to the menisci of the knee reaches the outer 10% to 33% of the body of the menisci (20-35% medial meniscus, 10-25% lateral meniscus). This portion of the menisci is capable of inflammation, repair, and remodeling. This part of the meniscus can repair. The central portion of the meniscus is avascular and relies on diffusion of nutrients from the synovial fluid. It rarely heals after injury. Meniscal injuries, particularly sports-related injuries, usually involve damage due to rotational force. A common mechanism of injury is a varus or valgus force directed to a flexed knee. When the foot is planted and the femur is internally rotated, a valgus force applied to a flexed knee may cause a tear of the medial meniscus. A varus force on a flexed knee with the femur externally rotated may lead to a lateral meniscus lesion. Medial meniscus injury are more common, possibly due to its greater attachments and resultant less mobility to move with forces. Degenerative meniscal tears are best thought of as a failure of the meniscus over time. The meniscus becomes less elastic and compliant and as a result may fail with only minimal trauma (such as just getting down into a squat). This scenario is enhanced with the spasm of the hamstring / popliteus that usually accompanies knee injury. Sometimes there are no memorable injuries or violent events that can be blamed as the cause of the tear. Joint line tenderness: Joint line tenderness is an accurate clinical sign. This finding is positive in 77-86% of cases with meniscus tears. Despite the high predictive value, operative findings occasionally differ from the preoperative assessment. 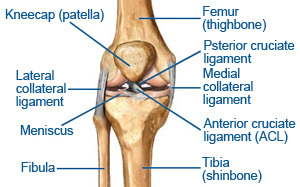 The examiner must differentiate collateral ligament tenderness that may extend further toward the ligament attachment sites, above and below the joint line. Effusion: Effusion occurs in approximately one half of patients presenting with a meniscus tear and is generally only slight in nature (grade 0-1). Effusion is suggestive of a peripheral tear in the vascular or red zone (especially when acute), an associated intra articular injury, or synovitis. Range of motion: Whilst crepitus is common, a mechanical block to motion or frank locking can occur with larger displaced tears. Restricted motion caused by pain or swelling also is common. Provocative maneuvers cause impingement by creating compression and/or shearing forces on the torn meniscus between femoral and tibial surfaces. McMurray test: This test usually elicits pain or a reproducible click in the presence of a meniscal tear. The medial meniscus is evaluated by extending the fully flexed knee with the foot/tibia internally rotated, while a varus stress is applied. The lateral meniscus is evaluated by extending from the fully flexed position with the foot/tibia externally rotated, while applying a valgus stress to the knee. One hand should be palpating the joint line during the maneuver. Steinmann test: Tibial rotation is performed with the patient seated and the knee flexed 90°. Asymmetric pain is created with external (medial meniscus) or internal (lateral meniscus) rotation. Apley test: This test is performed with the patient prone and the knee flexed 90°. An axial load is applied through the heel as the lower leg is internally and externally rotated. This grinding maneuver is suggestive of meniscal pathology if pain at the medial or lateral joint is elicited. Due to the incidence of concurrent injury in traumatic injury, the cruciate ligaments should be assessed along with the involved meniscus (Lachmans, Slocum’s, pivot shift manoeuvre, sag sign and drawers tests). A home physical therapy program or simple rest with activity modification associated with ice and nonsteroidal anti-inflammatory drugs (NSAIDs) is the nonoperative management of suspected meniscus tears. The physical therapy program goals are to minimize the effusion, normalize gait, normalize pain-free range of motion, prevent muscular atrophy, maintain proprioception, and maintain cardiovascular fitness. Choosing this course of treatment must include consideration of the patient’s age, activity level, duration of symptoms, type of meniscus tear, and associated injuries such as ligamentous pathology. A trial of conservative treatment should be attempted in all but the most severe cases such as a locked knee secondary to a displaced bucket-handle tear. Mobilisation of the patellofemoral joint may be conducted to restore mechanics to the joint, particularly if there is associated catching of the meniscus during ROM of the knee. Also, soft tissue therapy needs to be implemented due to reactive muscular spasming of the hamstrings and popliteus. Quadriceps weakness, partcilurly of the vastus medialis oblique, needs to be addressed by pain free strength work on the quadriceps. The main complication at this stage of treatment is the absence of healing and failure of symptoms to resolve. The natural history of a short (less than 1 cm), vascular, longitudinal tear is often one of healing or resolution of symptoms. Stable tears with minimal displacement, degenerative tears, or partial-thickness tears may become asymptomatic with nonoperative management. Most meniscal tears do not heal without intervention. If conservative treatment does not allow the patient to resume desired activities, occupation, or sport, surgical treatment should be considered. Surgical treatment of symptomatic meniscal tears is recommended because untreated tears may increase in size and may abrade articular cartilage resulting in arthritis. If symptoms persist, or if the patient cannot risk the delay of a potentially unsuccessful period of observation (eg, elite athletes), or in cases of a locked knee, surgical treatment is indicated. The basic principle of meniscus surgery is to save the meniscus. Tears with a high probability of healing with surgical intervention should be repaired. However, most tears are not repairable and resection must be restricted to only the dysfunctional portions preserving as much normal meniscus as possible. Arthroscopy, a minimally invasive outpatient procedure with lower morbidity, improved visualization, faster rehabilitation, and better outcomes than open meniscal surgery, is now the standard of care. At Synergy Healthcare, the aim of our treatment is to improve the patients symptoms and improve the mechanics at the injured site. This is done by mobilisations and manipulations of dysfunctional joints and soft tissue therapy to muscle spasm in the area. Functional exercises and stretches complete the rehabilitation process. For further information on Knee Meniscus and professional treatment available contact Synergy Healthcare today.